There are thousands of ebooks online depending on how you search such as Fort Wayne Indiana, Fort Wayne Americana and Allen County Indiana which finds lots of non-Allen County "stuff" online at Internet Archive. Many were digitized at our local The Genealogy Center at the Allen County Public Library in Fort Wayne, Indiana, some are Google ebooks and from other repositories. Links to some of those books are also organized by publication date or subject on our Timeline, People, and Places pages. You can find over 36,000 titles on various topics and locations many from the National Archives in the Allen County Public Library Genealogy Center-microfilm collection. Read My 5 Favorite Collections on Internet Archive by Gena Philibert-Ortega published November 26, 2018 on the Legacy News Family Tree blog. These days ebooks use optical character recognition for keyword searching, but they won't find every instance of every keyword. Be sure to look for an index in the back of the books, and when all else fails, read or scan important sections of the ebooks that might contain the information you are looking for even if a keyword search does or doesnot find what you are looking for. Some books in the The Genealogy Center at the Allen County Public Library in Fort Wayne, Indiana have added manually indexed versions of these book that will have surnames the OCR does not find. It can be helpful to consult the The Genealogy Center online card catlog to see if a separarte index has been created since the original publication. One example is the two volume Valley of the upper Maumee River, with historical account of Allen County and the city of Fort Wayne, Indiana which has a couple of different surname indexes. Digital Public Library has online access to thousands of historic materials. Hyperlocal history Publisher builds national imprint through tight focus on communities by Ron Charles of the Washington Post, published March 31, 2019 in The Journal Gazette newspaper. 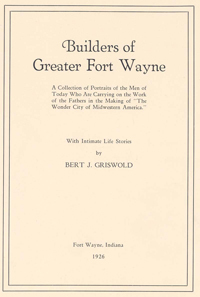 Builders of Greater Fort Wayne , A Collection of Portraits of the Men of Today Who Are Carrying on the Work of the Fathers in the Making of "The Wonder City of Midwestern America" published in 1926 by Bert J Griswold. The book has been indexed, photocopied and posted on the The Genealogy Center web site. Classic Restaurants of Fort Wayne by Keith Elchert and Laura Weston, 2019, Arcadia Publishing ISBN: 9781625859549 See Book highlights city's 'Classic' eateries by Kimberly Dupps Truesdell published March 6, 2019 in The Journal Gazette newspaper and KEVIN LEININGER: If you like food and history, new look at Fort Wayne’s past gives you something to devour by Kevin Leininger published April 11, 2019 in The News-Sentinel newspaper. Fort Wayne a Pictorial Love Story published around 2010 has old photos from 1889 to 1950 in a then and now recreated photo format on facing pages. This book is only available at the Fort Wayne History Center. There is a Facebook page by the same name. It was also mentioned in a May 24, 2018 discussion on You are positively from Fort Wayne, if you remember... Closed group on Facebook. Fort Wayne, Indiana : a presentation of her resources, achievements and possibilities ... (1913) Gardner, H. W., Fort Wayne News, 136 pages, an Archive.org ebook. Fort Wayne Postcards by Randolph L. Harter, Arcadia Publishing, 2013. The Griswold-Phelps handbook and guide to Fort Wayne, Indiana, for 1913-1914 by Griswold, B. J. (Bert Joseph), 1873-1927; Published 1913. Index to History of Fort Wayne & Allen County, Indiana, 1700-2005 at The Genealogy Center. Legendary Locals of Fort Wayne, Indiana by Randolph L. Harter and Craig S. Leonard, 2015, Arcadia Publishing ISBN : 9781467102100. Lincoln Collection - Welcome to the Lincoln Financial Foundation Collection on Internet Archive. Browse by Title or Author. The Lincoln Financial Collection, Books contributed from the Lincoln Financial Collection held in the Lincoln Library, Allen County Public Library, Fort Wayne, Indiana. Over 2,000 titles digitized from the collection. Memorial record of northeastern Indiana published in 1896 by Lewis Publishing Company of Chicago has over 900 pages of Biographical Sketches. Men of progress, Indiana : a selected list of biographical sketches and portraits of the leaders in business, professional and official life, together with brief notes of the history and character of Indiana , covers all of Indiana, not just Fort Wayne. by Cumback, Will; Maynard, J. B; McGrath, Hugh J; Stoddard, William, 1899. Outpost in the Wilderness: Fort Wayne, 1706-1828 by Charles Poinsatte published October 17, 2017 EBook #55762 on the Gutenberg Project. Bessie Pearl (Miller) Shaner : b 12 Oct 1890, d 26 Sep 1954 (19--]) - Fleetwood, Clarence Leroy, 1919-, Miller- Fleetwood Families. Standard atlas of Allen County, Indiana : including a plat book of the villages, cities and townships of the county; map of the state, United States and world; patrons directory, reference business directory and departments devoted to general information by the Geo. A. Ogle & Co. of Chicago in 1898 has lots of interesting maps of the county, townships and the United States. Perhaps most surprising is Portrait Department of locally promient citizens starting on page 94. Streets of Fort Wayne McCoy, Angus Cameron, from "a speech before the Quest Club, November 30, 1945," prepared by the staff of the Public Library of Fort Wayne and Allen County. Stories about the history of Poe : Allen County, Indiana, on the letterhead of Fort Wayne chapter, Order of DeMolay ([19--])y - 22 pages. Valley of the upper Maumee River, with historical account of Allen County and the city of Fort Wayne, Indiana Volume 2; Published 1889. Search The Genealogy Center online catalog for indexes in the library for this book. Your Summer Reading by Carmen Doyle published May 21, 2014 in History Center Notes & Queries blog discusses several new history books: The Iron Men of Indiana’s 44th Regiment is two volumes. Part 1: Biographies and Regimental Statistics with mini bios and Part 2: Formation and Photos details about the company during the Civil War; Salt: A Story of Friendship in a Time of War about a Miami Indian and pioneer boy in 1812; Shopping in Fort Wayne 1848 ; and two cookbooks, Blue and Grey Cookery: Authentic recipes form the Civil War Years and Johnny Apppleseed Cookbook: Favorite apple recipes of our land .